Sometimes it’s the simplest of things that set my cravings off, and it’s always the foods with no readily available substitute that I want the most. Although this can be incredibly frustrating it never fails to inspire me to get creative in the kitchen and get cooking. 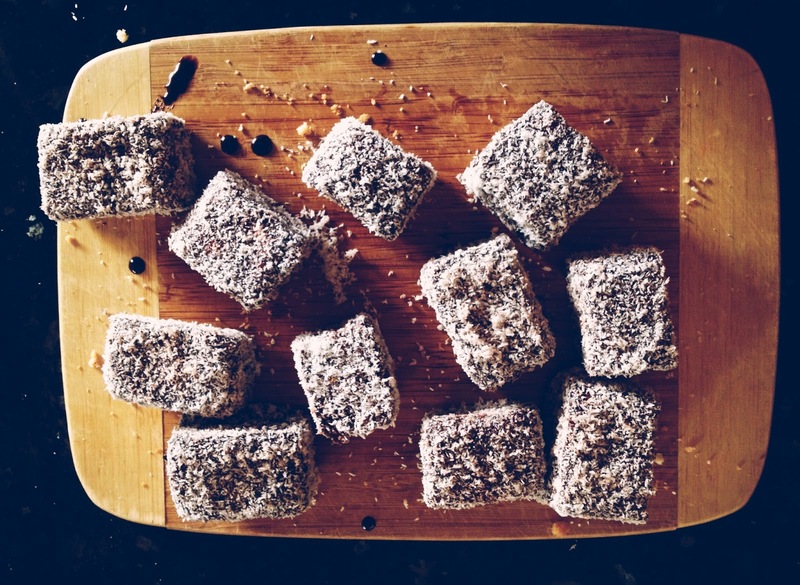 When my friend Kim called to inform me of her birthday plans – something along the lines of ‘we’re playing bowls and eating lamingtons’ – it came as a shock to me that I hadn’t eaten a lamington in years. I haven’t ever seen or heard of gluten free lamingtons, and any that do exist will likely be full of sugar anyway. Before I could even hang up the phone I was online researching. Almost all the recipes I found were overloaded with refined sugar. How chocolate coating possibly requires up to 4 cups of icing sugar baffles me! I didn’t have much luck with my recipe search so I thought I’d give a simple sponge recipe a go, substituting pre-mixed gluten free flour and reducing the sugar as much as possible. It’s not often the first attempt of gluten-free-ing a standard recipe works, but this was an exception and oh my these were delish!! By all means these are not healthy, but I managed to decrease the sugar content while still keeping the sponge light and fluffy. When the day of Kim’s birthday rolled around, I headed to the Bowls club to celebrate with high spirits and lamingtons in hand. What I lacked in sporting skills, I think I made up with my baking. Not one person could tell that my lamingtons were gluten free, or missed the extra sugar, and everyone who tried them agreed on their deliciously sponginess. To make the sponge: Preheat oven to 180°C and grease a 20x30cm rectangle cake tin and line the base with non-stick baking paper. Place the eggs, sugar and vanilla in a bowl and beat with an electric mixer for 8–10 minutes, or until thick, pale and tripled in volume. Sift the flour over the egg mixture and gently fold through with a metal spoon. Fold through the melted butter. Pour into prepared tin and bake for 25 minutes or until the cake is springy to touch and comes away from the sides. Let it cool and cut into squares or any shape you fancy. To make the coating: Place the icing sugar, cocoa, butter and milk in a heat proof bowl over a saucepan of simmering water. Stir the mixture until it is smooth and slightly thickened. Have the chocolate icing and coconut ready in separate bowls. Quickly coat each sponge cake in the icing mixture and then gently roll in coconut. This step is quicker and much more fun if done with a friend! This was a childhood favourite when I lived in Australia. Now I am coeliac. Can anyone tell me if ‘cornflour’ refers to the white starch cornflour or if it is the yellow ‘cornmeal’ flour. 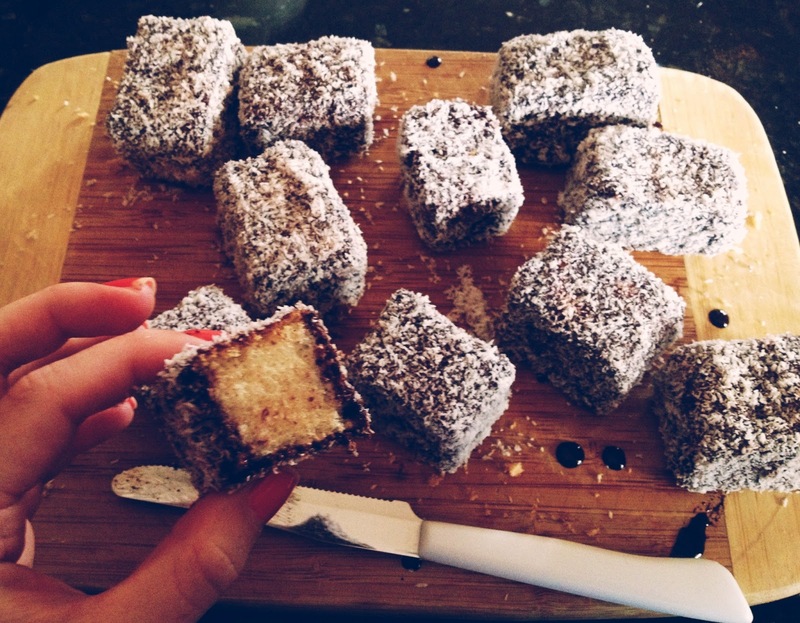 I have just made these lamingtons and they are fabulous, thank you so much! My daughter has recently been put on the low FODMAP diet, and I have been searching everywhere for great recipes. I followed this recipe to the letter, it baked perfectly and everybody at our gathering was amazed that they were GF. Thanks again. How did these go please? Keen to know if they are fail-proof. Thank you.